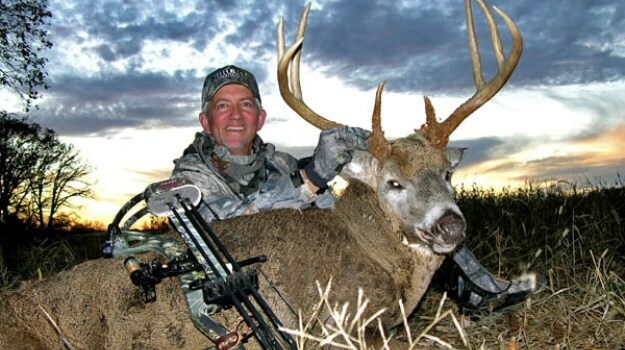 Editor’s Note: Terry Drury, the co-owner with his brother Mark of Drury Outdoors, produces several TV shows, including “Bow Madness,” “Dream Season BioLogic,” and “Drury Outdoors Wildlife Obsession” for the Outdoor Channel and “Natural Born,” which airs on the Pursuit Network, and has been a member of Mossy Oak’s ProStaff since its beginning. Birds build nests in trees and bushes, and these nests are supported by branches and limbs and are almost invisible to predators. This is the same strategy I use when I am bowhunting in the early season. I like to have limbs and bushes especially under my treestand that hide my body up to my knees or waist. This way, there is only half as much of me for the deer to see, than there will be if I’m totally exposed. I like to be nested into the tree from which I am hunting. I have one stand that I really enjoy hunting from, and I call this stand the Eagle’s Nest, because I have so-many branches and limbs around the bottom of it. I feel like this helps the stand site look just like an eagle’s nest. You also have to remember to clear-out enough limbs, so, if you have to turn to the left or right to get off a shot, your bow or your arrow won’t touch any limbs or branches. We all like to clear-out shooting lanes. We usually think about shooting lanes as paths for the arrow to travel without being obstructed or deflected. But, many times we overlook the brush and limbs that are right in front of our face. We think, “I can shoot around through those limbs.” You may be absolutely right. However, deer don’t always present the shots when they are standing perfectly broadside in a shooting lane that you have cut. Most of the time you will have to turn to the left or right to get the shot. So, you want to make sure that you don’t have any obstructions that will knock your arrow off the rest, get in-between your cams or cause you to not be able to make the shot, when the deer arrives. 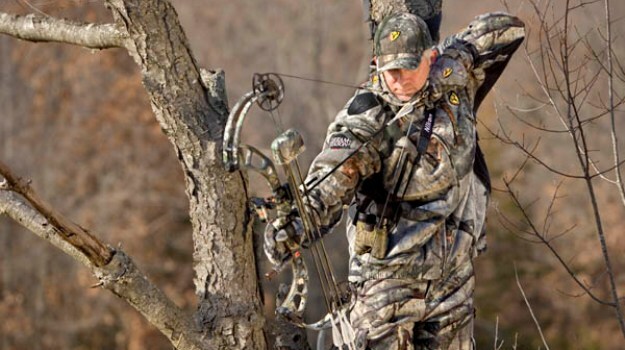 One of the best ways to make sure you can take the shot when it presents itself when you are in the treestand is to practice drawing and turning with your bow, whether you are sitting down and shooting, or standing up and shooting. If you are going to sit and shoot, you want to make sure that the bottom cam on your bow is not hitting any of the limbs, bushes or leaves that you have left to hide your tree stand and you. I am often asked, “Where do you put your tree stand during the early season?” Always, my answer is, “On the edge of a green field.” Usually, we will be hunting over a planting of Mossy Oak BioLogic Clover Plus in early bow season. We may have several spots on the edge of that green field where we have planted the new Mossy Oak BioLogic Deer Radish. The radishes are really palatable to the deer. The tops of the radishes and the clover contain a lot of moisture that deer need, especially during the warm weather of early bow season. The two things we are most concerned with when we are hunting over early-season green fields is access (how we get back and forth to our treestand without spooking the deer, or the deer seeing or smelling us) and our back cover (making sure there are enough limbs, branches and leaves to keep us and our treestands from being silhouetted and that our back cover breaks-up our forms and our treestands). In the early season we may set-up with a cedar tree behind us and/or off to the side of us, and maybe a black walnut in front of us. We may be set-up in a white oak tree that has a lot of limbs and leaves in it. So, the deer in the field can’t see us. When they look at us, our back cover and Mossy Oak camouflage makes us appear to be a part of that cover behind us. During the early season, there are a lot of leaves to help hide you in your treestand. If you set-up and nest in your tree, the limbs of the tree can help break-up your silhouette. Because we are so confident in our Mossy Oak camouflage, we’ll cut a lot of limbs out from in front of us that most bowhunters won’t cut. We want to make sure we have cleared-out shooting lanes. Then anywhere the deer presents a shot opportunity, we can take the shot. Once you’ve pinpointed an area where all signs indicate a turkey’s there, and you’ve gone out and listened for a turkey to gobble before daylight to confirm that a gobbler is there where you plan to hunt, next find a listening spot. 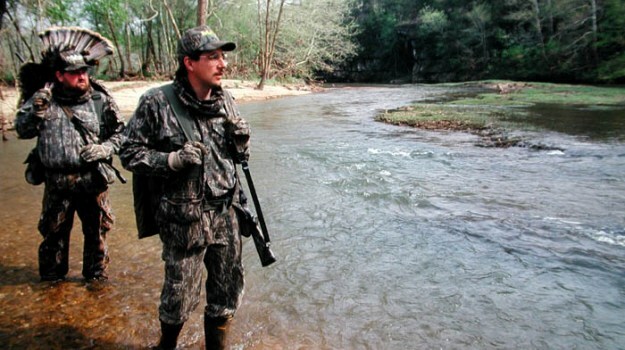 Turkey hunting is more audible than visual. By that I mean, you should be able to hear a turkey much more than you can see a turkey. 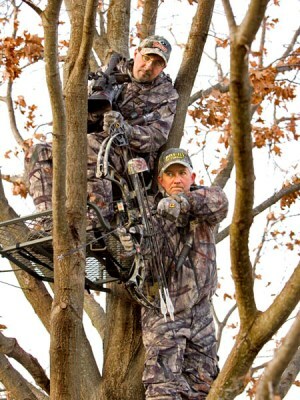 Many hunters have questions about treestand placement. Every situation is different and there aren't any rules where there aren't exceptions. However, there are some general practices that will help in most situations when placing a treestand. 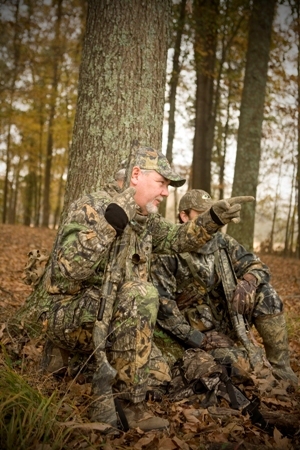 Many hunters have questions about treestand placement. "How high do you go in the tree?" is one of the most asked questions on the topic. Every situation is different and there aren't any rules where there aren't exceptions. However, there are some general practices that will help in most situations when placing a treestand.